OUR PRICE: $19.50 - Join Rewards Get $1 Dance Dollars On This Item! Meet your new go-to ballet slipper. 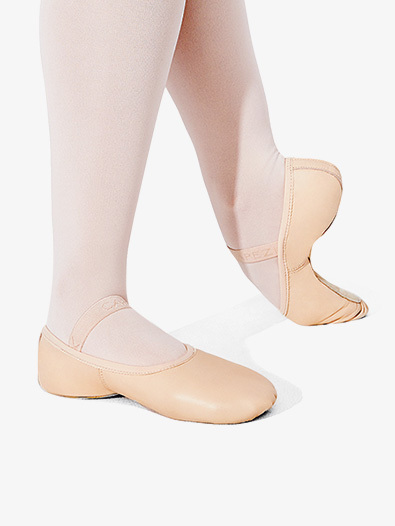 Capezio's "Lily" ballet slipper features soft leather, a full sole, and a suede footbed. Straps are pre-attached, saving you the hassle of having to sew them on yourself! Suggested Fitting: Same as street size. My daughter wears a size 6 in street shoes and according to the sizing chart for this style is says "same as street style". This is not the case. The shoe barely came to the base of my daughter's toes. Now I'm trying to guess what actual size she needs since there really is nothing to go off of. I use this site for all of her dancewear but the sizing for the shoes seriously needs to be fixed. As far as the star rating I'm sure they would be great shoes if they fit.